All hail to Schlangster and the SkyUI team! 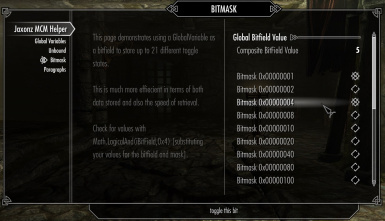 Just a little help for a Skyrim's #1 mod. MCM menus in SkyUI are a real blessing for modders, allowing us to present rich, easy-to-use configuration panels to users. 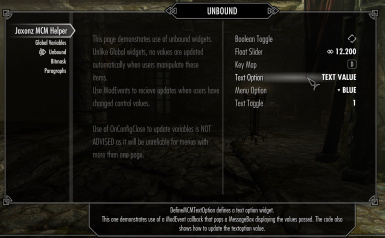 I'm so grateful for SkyUI and I'm happy to give back to the Skyrim modding community with this simple library. 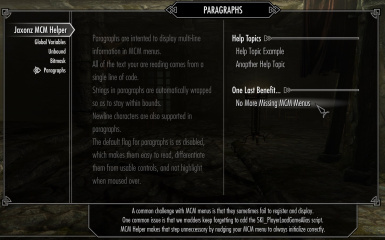 I found coding MCM menus a little challenging and tedious, so I created MCM Helper to make authoring MCM menus easy. Most elements can be created with a single line of declarative code. MCM Helper handles all of those complexities. No longer will your MCM script have to be 1000 lines long and difficult to maintain. Need to do something unusual or special? You still have full access to normal MCM functions or can use one of MCM Helper's integrated ModEvent callbacks. 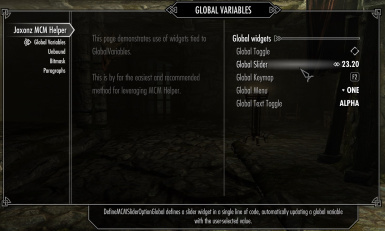 Provides one-line versions of Toggle, Text, Slider, Keymap and Menu widgets. One-line paragraph of text with automatic wrapping. One-line simple help topics for in-game FAQ or helpful hints. One-line toggle using global variable as a bit field; allows storing up to 21 different toggle states in a single GlobalVariable. GlobalVariable-bound or normal versions of each function. Supports ModEvent callbacks for each function. Eliminates the need for the SKI_PlayerLoadGameAlias script, a common cause of missing MCM menus. My preference is that you use this as-is as a resource. If you find opportunities for improvements just let me know and everyone will benefit. If you do make changes for your own use, please change the file and class name so that you don't break my mods. Create a new script for your MCM menu extending this script. Declare a GlobalVariable for each widget. Bind your GlobalVariable properties to CK objects and you are all set! The downloadable file includes fully documented working examples of all MCM capabilities. I have not yet completely documented the functions. Please refer to the code in the demo mod. The JaxonzMCMHelper.psc file is also fairly well commented. One item I have not yet resolved is that the MCM ShowMessage function does not work in conjunction with this script. Menus created with MCMHelper cannot use ShowMessage. I hope to fix this shortly. 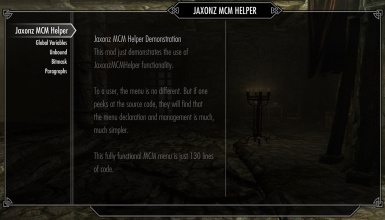 Let us know if you use MCM Helper in your mod and I will proudly add it to the list. Public posting lets everyone provide help and it builds a body of information that can help answer questions without having to wait for a response.